Anyone else feel like they spend half their life in the kitchen? Cooking, eating, listening to "mom, I don't want to eat that"... I am always looking for ways to make everything in the kitchen more efficient, healthier, and more convenient. This means that often I will make a meal larger and refrigerate or freeze the leftovers so that I can almost cut in half the time I spend there. I have been using regular plastic containers for a long time and slowly I am converting to healthier and more sustainable options. 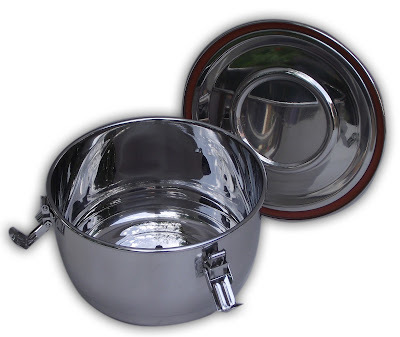 When I saw the airtight watertight stainless steel food storage containers at NoPlastic.ca I was really excited! They are a perfect combination of materials and perfect for so many uses. It is exactly what I was looking for. Perfect for dry goods and liquids, no spills! Camping: It is airtight and thus contains odors - keep those animals away! Work Lunch: Originally this was the purpose I wanted this container for, until I was surprised by how deep it is. They carry smaller/shallower ones that would be perfect for taking lunch to work. Beach: It is large enough to cut up chunks of watermelon to take with you to the beach or for a picnic for a few people. Dry Goods: I need a huge one just like this for storing our bulk flour, sugar, and rice that we buy in 50 lb bags. It's really inconvenient for me to reach into those bags every time I bake (which is every day), it would be perfect to fill a container and keep it more accessible. Cookie Jar: I make cookies twice a week and we keep them in a jar that doesn't keep them very fresh, after two days they taste a little stale because the jar isn't airtight. This would be the perfect solution. 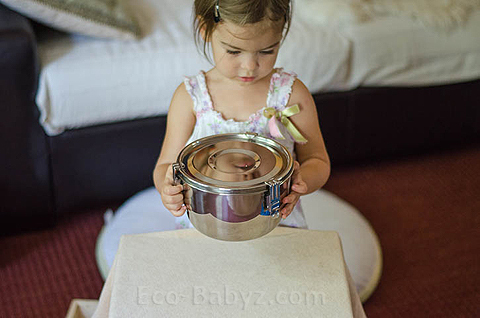 Kids Snacks: The smallest 3" container would be perfect for my kids' snacks on the go. 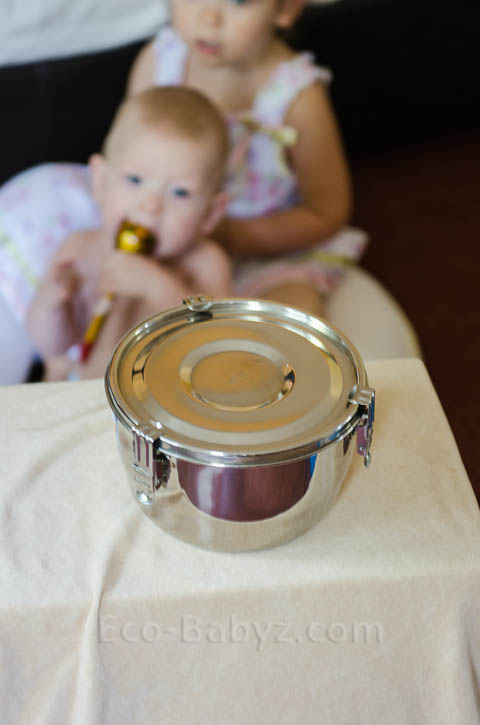 Our experience with this stainless food container has been fantastic! Take this, I had some leftovers of two soups, the one I kept in this container was older but was still fresh when I opened it and the newer soup I made that I kept in a regular pot with lid spoiled first. When you put leftovers in this container that are hot or warm, close the lid, it creates a vacuum and keeps food very fresh for a lot longer! This is great if you're like me and forget about things in the fridge. The size that we reviewed is the 18cm, it has a capacity of 59 oz and retails for $22.99. The smallest one that's great for kids snacks is $12.99. The gigantic one that's great for bulk foods and holds 4.5 gallons costs $69.99. Класс! Я от вашего подарка тоже балдею...! i just bought a set of these, i love them to pieces ! Anything to keep my family safe !!!! !